Tea time! Tea time! This is one of my tea time pit stop to buy some hot Malay style fried kuih (local delicacies fried in flour batter). This stall is located right in front of Pasaraya (minimarket) Grand Union. I normally buy the crispy fried popiah (spring rolls), RM1 for 3 pieces. The popiah is nice and crispy but the chilly sauce is a bit bland for me. I have asked the makcik (aunty, in Bahasa Malaysia) to make the chilly a little bit more spicy. 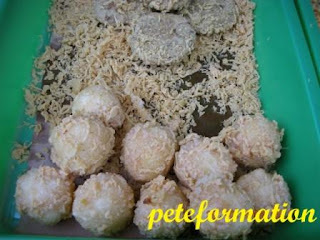 Other kuih available, that are fried in flour batter are sweet potato, tapioca, tapioca balls, yam and chempedak (Artocarpus Integer, a seasonal fruit that are related to jackfruit but more pungent in smell). This hardworking makcik operates her stall daily from 11am to 5pm. Do drop by if you are in this area. 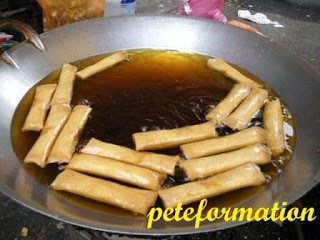 Frying popiah in hot oil...........................................Draining away excess oil. I love Malay kuih stalls...the clean ones! Some never cover the food. My post today is on one... Great minds think alike! I like goreng pisang too! Fried yam and fried sweet potato aremy favorite! i love fried poh piah. with the right chilli sauce, it beats eating expensive food even. 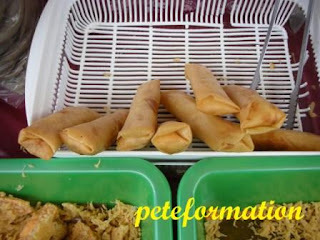 waaaa the popiah is tempting me to eat them!! probably im hungry now..haha..
STP : wow, the stall you posted is super clean. Kuih looks nice too! 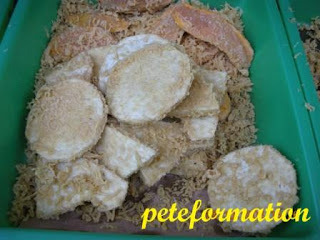 Kikey : Fried yam would be nice is the yam is soft and powdery....yummy! Kenwooi : Hi Ken, got a little busy with work lorrr. Seldom online these days. Try to write new post whenever I can. Walao.... oily food... all my favourite... ahahahaha... being skinny is kinda good, cuz nonid to afraid of oily food like those jigglypuff in my office. LOL.